Well. They're 235/85R16, when supplied by Michelin. I have the A/T variant (XLT) on my 4x4 LT. Really good tyres alright. An interesting profile for mud terrains are also Kumho KL71's, which also can be got 235/85R16. 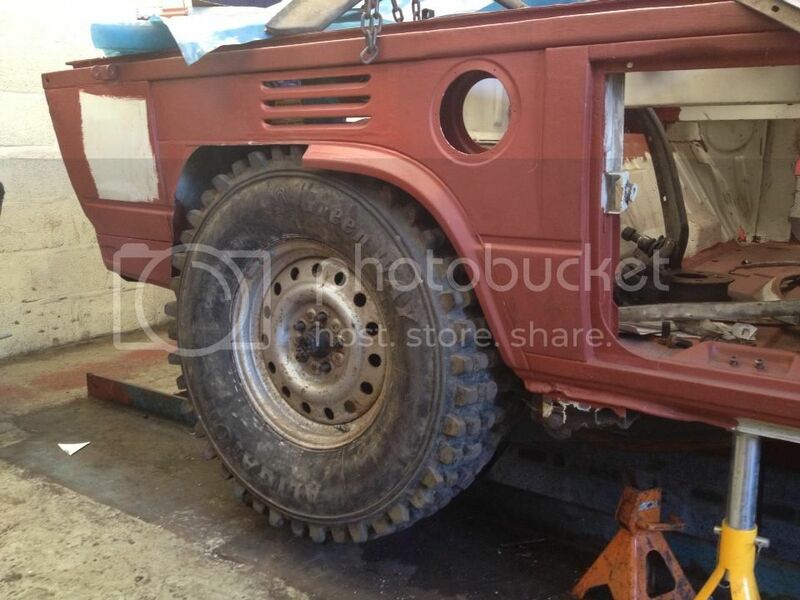 Elvis any news about the 235/85 r16 fitting pictures? Super keen to see some. There were 2 Syncros with 7.50x16 at Busfest this weekend. The red one here and if I recall correctly the dutch white one to the right of it with the winch. I had a good look at the work done on the red one and he's made substancial cuts in the front, similar to what I had to do with the LT, when I fitted 9.00x16's. On the rear it was no problem, but it has to be a 16". Won't fit on a 14". Maybe somebody has better pictures. I completely forget taking them. Had a good chat with the lad that owned the red one though. Marlow wrote: There were 2 Syncros with 7.50x16 at Busfest this weekend. There's a good view of the red T3 on 7.50R16's in this video. The video isn't mine. It's one of the lads on the T4 Forum, that has taken it. i`ll have clearance for genuine 35" when its done, wether 35`s and 6.16`s will work off road is another thing. maybe custom fd`s would help. sponsers welcome. lol. I'm running 235/85/16 on mine currently. It's taken quite a bit of fiddling and modifying to get them to fit. Stretched wheel arches, modified outriggers, custom trailing arms, wheel spacers, suspension lift, shock extensions, ball joint spacers etc etc. Still ironing out little niggles with it now, unexpected little things. I was anticipating the front wheels to cause most of the trouble however oddly the rears are what's making me scratch my head. The combination of longer trailing arms, shock extenders and a suspension lift isn't working quite right just yet. I'm getting 'top out' from my shocks which wasn't there before I changed to longer swing arms, additionally the shock extenders push the shock rearwards a little too far causing interference between the shock and fuel filler pipe. In fact I still have to ascertain if the noise I can hear is 'top out' or whether it is the shock body touching something it shouldn't on full extension. Let me know if there's any specific info you'd like regarding fitting this size of tyre, glad to help. v-lux wrote: I'm running 235/85/16 on mine currently. Thank you so much v-lux for the info, it would be sick if I could have some pictures about the details, about arches, especially outriggers modfications. Does anybody have some detailed picture of the mod. to do at the front outrigger and general grinding to do? Take front out rigger off- drill out spots etc and remove it completely as if it was never there. Put brand new jacking point on an inch or so further back.